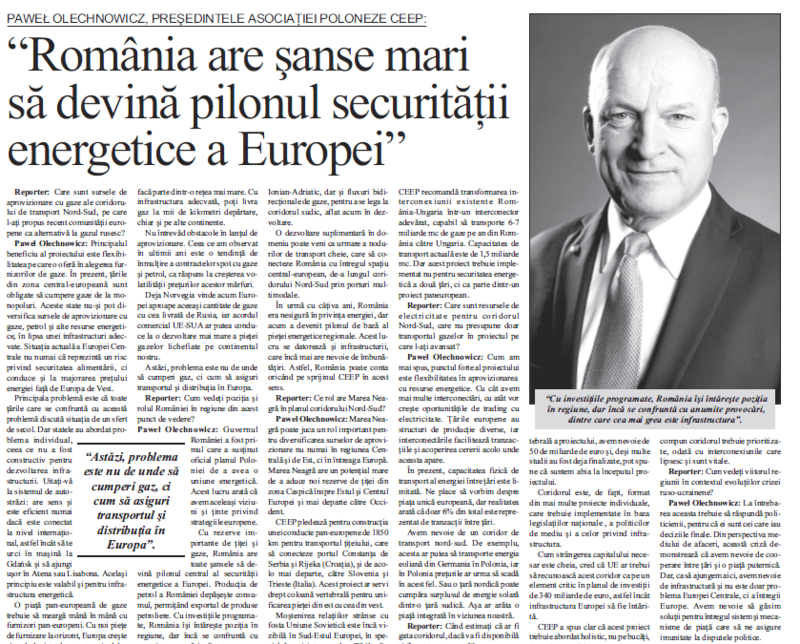 Interview with the CEEP Chairman of the Board of Directors, Pawel Olechnowicz, published by the Romanian business daily newspaper “Bursa”, on the 2nd of February. Reporter (R): What exactly are the sources of gas for the North-South corridor presented as an alternative to the Russian gas? Pawel Olechnowicz (PO): The key benefit of the corridor is the flexibility it gives in the choice of suppliers who may deliver gas. At the moment, most Central European countries have to buy from monopolies. They cannot change their gas, oil or energy suppliers as they lack proper infrastructure. This not only constitutes a supply-security risk, but also increases energy prices in comparison with the Western European market. The main problem is that we all face similar challenges, and have been discussing them for almost a quarter of a century. However, we have been doing this separately, which is not effective for infrastructural development. Look at the highways network – it only makes sense when it is internationally connected, so you can get into your car in Gdańsk and drive easily to Athens or Lisbon. The same is true with energy infrastructure. A pan-European gas market goes together with pan-European gas suppliers. With new supply markets on the horizon, Europe is increasingly installing specialist terminals, which will allow gas to be imported from remote countries in the form of liquefied natural gas. The point is that these terminals need to be part of a broader network. With proper infrastructure, you can deliver gas to any of the continent’s terminals and sell it thousands of kilometres away. I do not see a particular threat on the supply side. What we can definitely observe in recent years is rather a shift towards more spot contracts in gas and oil delivery, which is the answer to the increasing volatility in prices of these resources. Already now, Norway sells to Europe almost the same quantities of gas as Russia, and the EU–US trade agreement may further expand the LNG supply market for the continent. Today, the question is not where to take gas from, but how to infrastructurally secure its distribution within the whole EU. [Tweet "Romania’s government was the first to officially support Poland’s plan for an energy union"]R: What is your perception of Romania's actions within our region from the energy point of view? PO: Romania’s government was the first to officially support Poland’s plan for an energy union. This shows that we share common goals and understanding for Europe’s most important strategies. With significant oil and gas deposits, Romania stands every chance of becoming a key pillar of the Europe’s energy security. Romania’s oil output already exceeds domestic consumption, allowing the export of the surplus petroleum products. With more investments around the corner, Romania is strengthening its position in the region, which we welcome. There are still challenges, and the crucial one is infrastructure. Romania needs more integration with the region through the Ionian Adriatic Pipeline and bi-directional interconnectors as a way to tap into the Southern Gas Corridor, which is currently under development. A considerable upgrade in this area could also be due to the further development of key intermodal transport connections linking the whole region of Central Europe, along the North–South Corridor, to Romania’s multimodal ports. The country, a few years ago, felt considerably insecure in terms of energy, but is now becoming the CE region’s energy bedrock. This is also due to the infrastructure which still needs to be developed. Romania can always count on CEEP’s support in this respect. R: What is the Black Sea role in this plan? PO: The Black Sea may play an important role in the plan of energy sources diversification, not only for Central and Eastern Europe, but for the whole continent. It has a strong potential to bring new deliveries of oil from the Caspian Sea countries into Central and Eastern Europe and further north–west. CEEP advocates the construction of a nearly 1,850 kilometre-long pan-European oil pipeline connecting the Romanian port of Constanta, via Serbia, to Rijeka in Croatia, and from there, through Slovenia, to Trieste in Italy. This could serve as a horizontal backbone for bringing the Western and Eastern parts of the continent into one market with a unified infrastructure. The heritage of the close ties with the Soviet Union is still visible in the South-Eastern part of the continent, also in relation to the gas links. The countries from this part of Europe either lack north–south interconnectors or the existing ones need an upgrade. Therefore, at CEEP, we recommend the transformation of the existing Romania–Hungary gas line into a genuine interconnector capable of carrying at least 6–7 billion cubic metres per year from Romania to Hungary, and the development of a large-scale 6–10 billion cubic metre Bulgaria–Romania gas interconnector to replace the hitherto 1.5-billion capacity one. However, we need to implement this not as an energy security project for one or two countries, but as a part of a broader pan-European plan. R: What are the electricity resources for this corridor? PO: The key point of the corridor is to allow flexibility in supplies. The more infrastructural connections we have, the wider are the possibilities for opening up trade in electricity. Different European countries have various energy generation structures, and cross-border swaps facilitate the sale of excessive power capacities or filling the supply gaps, if such gaps appear. We can monitor some positive consequences for this flexibility already, even though there is very limited capacity in the physical exchange of power between EU members. We like to talk about the EU’s common market, but the fact is that only 6 percent of electricity is sold in cross-border transactions within the EU. We need cross-border infrastructure and this need is especially dramatic on the north–south direction. For instance, wind power generation in Germany may lower energy prices in Poland. We can imagine that one day a country from the north of Europe can buy surplus solar energy from the south in the summer, while southern countries can buy surplus power generated during windy winters. This is the real integrated market that we envision. R: When will this corridor be finished if the necessary funds are available? [Tweet "To build a backbone of the project we need ca. €50 billion"]PO: We first need to make these funds available. To build a backbone of the project we need ca. €50 billion, and although serious studies have already been done, we are rather more at the starting point than moving towards a successful end. The corridor is actually a number of individual projects that need to be carried out based on national legislation, environmental policies and infrastructural challenges. As capital-raising is the key, we believe the European Commission should acknowledge the corridor as a critical element of the €340 billion plan being developed to leverage public and private investments, in order to strengthen Europe’s infrastructure, drive forward economic growth and enhance energy security. The corridor should then be reflected in the mandates of relevant European commissioners, as in these times of austerity raising new public funds to invest in infrastructure is very difficult. At the same time, we make it clear that the corridor should be approached holistically, guided by a vision that integrates gas and oil infrastructure, electricity interconnections, rail and road networks, and telecommunications investments. This gives you the idea of the project’s scale. In this case, individual projects will obviously need to be prioritized. The top priority is infrastructure connectors whose acceleration and completion are most critical in finishing the corridor, along with the integration of Central Europe with the rest of the EU. Focusing on the corridor’s most urgent missing links and bottlenecks is the best way to accelerate the project and to demonstrate the corridor’s commercial viability. R: How do you see the future of the CE region in the recent context of the Russia/Ukraine conflict? PO: This is a question for politicians, as they make the final decisions. From the business and industry perspective, I can say that this crisis proves we need more co-operation and a stronger common market. This, however, demands infrastructure which we lack at the moment, and it is not a question of CE’s security only. We perceive Russia as a major supplier and Ukraine as a transit country, and these factors can impact on our region. Nevertheless, in the future, European macro-regions may have similar problems. That is why we can say that energy security is not a problem this or that country or region. It is a common challenge for the whole EU. We need to undertake a system solution so that free market mechanisms will provide some immunity to the political upheavals. The original text in Romanian.